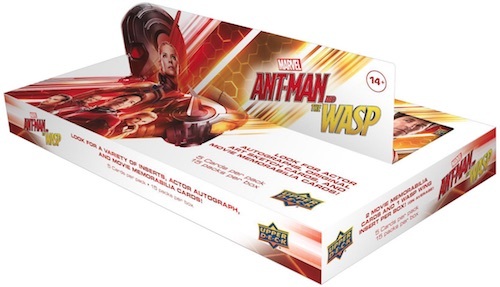 2018 Upper Deck Ant-Man and the Wasp adds some extra bite (and sting) to Marvel trading cards. Each Hobby box averages two memorabilia cards and one exclusive Wasp Wing insert, while every pack includes one mini card and one insert. 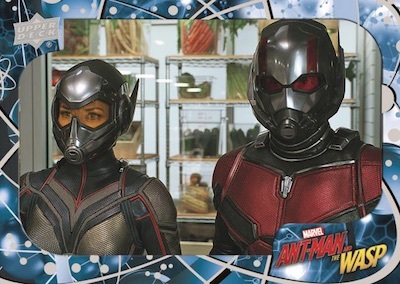 Focusing on Paul Rudd as Ant-Man and Evangeline Lilly as the Wasp, the set follows Upper Deck's 2015 Ant-Man card release. Using the 100-card base set to summarize the film, 2018 Upper Deck Ant-Man and the Wasp offers a film-appropriate Mini parallel at one per pack. In fact, the additional 50-card High-Series subset (#101-150) is only issued in mini form. Inserts combine to average one per pack and include Behind the Scenes, Tiny Tech and X-Con Background Check. 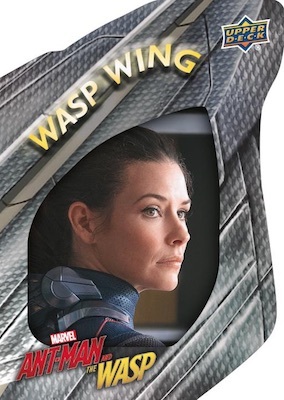 Exclusive to Hobby boxes, collectors should find one of the die-cut Wasp Wing inserts in each box. 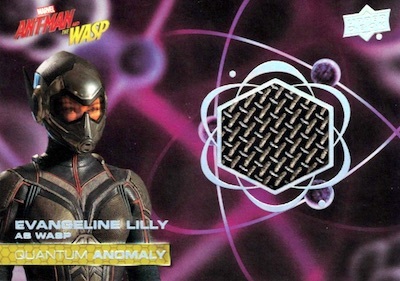 Premium hits are also waiting within the Upper Deck Ant-Man and the Wasp checklist. Quantum Stars is the name of the main autograph line and these signed cards average approximately 1:4 boxes. There are also rare photo variants and mini autographs. 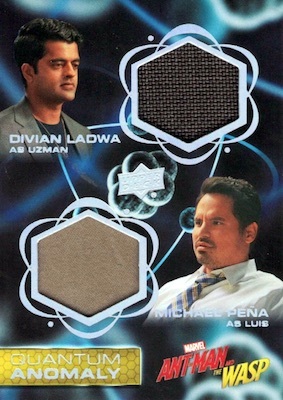 Adding to that, Quantum Anomaly covers the movie memorabilia in multiple iterations. These relics should fall two per Hobby box. There are autograph relic cards to hunt down, as well. 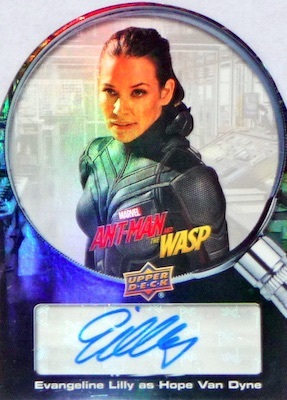 Also averaging 1:4 boxes, hand-drawn Sketch cards are another possible hit in 2018 Upper Deck Ant-Man and the Wasp. 100 cards. 3 per pack. 150 cards. 1 per pack. Buy 2018 UD Ant-Man & the Wasp autographs on eBay. Overall odds: Portrait - 1:160 packs; Torso - 1:320 packs; Full Body - 1:640 packs. Overall odds - 1:15 packs. Specific group odds noted. Overall odds - 1:45 packs. Specific group odds noted. Overall odds - 1:90 packs. Specific group odds noted. 18 cards. 1:15 Hobby packs.